The Metal Gear series is 25 years old this year. From its modest beginnings on the MSX2 console (the what? ), to its big break on the Playstation with Metal Gear Solid and now with the highly anticipated Metal Gear Rising Revengeance, Metal Gear has come a long way to become a globally popular series. But it wasn't always intended to be that way. In an interview with Weekly Famitsu, Hideo Kojima stated that he had never expected his game, Metal Gear Solid, to be such a hit overseas and that he hadn't even had the overseas market in his scope at the time. "I made Metal Gear Solid almost as a hobby." Kojima laughed. "I had always been making games on minor platforms and had never stood at the forefront of the stage." In fact, the overseas response to Metal Gear Solid never reached Kojima's ears until long after the US and European release. He became aware of his own fame during a global tour to promote Metal Gear Solid when everywhere he went, people recognized his face. Said Kojima, "Metal Gear Solid was my debut as a producer, but I never really thought about markets then. I suppose that was a good thing." Metal Gear is also one of the founders of the stealth game genre, but for Kojima, the main focus of the game was always elsewhere. "For me, the action mixed with the story had always been more important than the 'stealth' side of the game." Kojima remarked. The focus on these aspects is what led to the decision to have the cut scenes of Metal Gear Solid use the character models from the game rather than the ever popular pre-rendered CG cut scenes. This allowed for a more uninterrupted immersion into the game world and to tie the gameplay and the story closer together. The story side of the Metal Gear series is well known for being complex (some would say "convoluted") with its many twists, turns, and overlaps. During his 25th anniversary global tour, one of the most common questions Kojima receives is whether or not the plot was planned from the start. "Of course not." Kojima said with a laugh. "We had to struggle to make the plot lines meet. We did manage to clear a lot of things up with Metal Gear Solid 4: Guns of the Patriots, but fans still point out small inconsistencies." 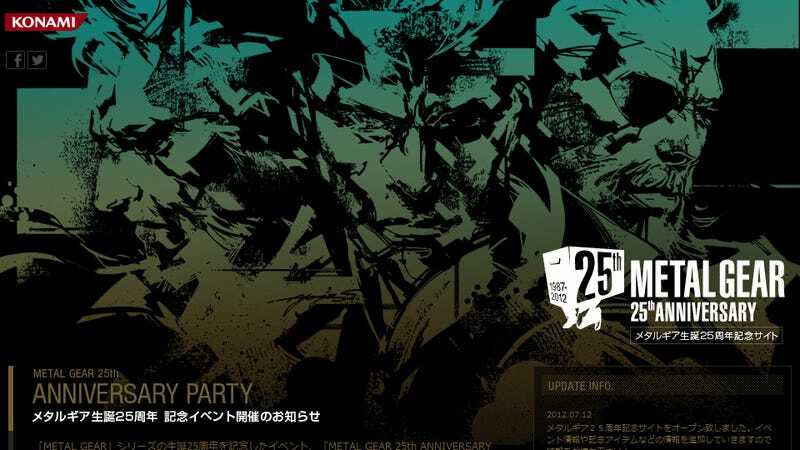 To celebrate 25 years in the making, Konami has created a 25th anniversary site and is planning a 25th anniversary party for August 30th. As an additional bonus, Metal Gear Solid 4: Guns of the Patriots will be getting a trophy system version and an update patch in August.